Install HDMI, VGA, CAT6, power outlet, USB and composite audio/video access panels to the desktop and then output to an HDMI display or projector in a hidden, concealed design. 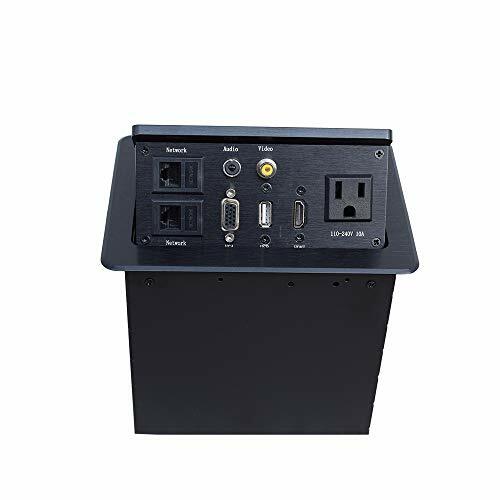 The B07KT87V95 automatic conference table connection box features a hidden desktop design that connects a VGA, HDMI or composite video source device to an HDMI display or projector. When not using the video switch, simply slide the stylish cover over the connector and hide them in the surface of the table or platform. Convenient accessibility: Presenters can easily share content with their devices, and desktop switches automatically convert any connected audio/video source source to a single HDMI output. The switch box also provides a stylish integration for your modern meeting room or classroom with a hidden concealed panel. For your convenience, the B07KT87V95 has a USB charging port for charging mobile devices and an Ethernet pass-through port for Internet connectivity in conference rooms where Wi-Fi is not available. Connection options: The video switch supports different video inputs, including: HDMI, VGA, Mini DisplayPort and composite video, ensuring support for almost any laptop Easy collaboration: The A/V switch allows any presenter's video source device to access a large display, mount directly to the surface of the desktop or lectern, and automatically output the most recently connected video source. In addition, support for HD video resolutions up to 1920x1080 (1080p) ensures the quality of your presentation is maintained.